One of the meanings of the adjective "Byzantine" is "surreptitious, vile". Last year, Croatian Prime Minister Zoran Milanovic used this word several times to illustrate lack of civilisation. "I will not give up on this civilisational battle because health and sexual education of the Croatian children is at the level of what the richest, most developed countries have from the Western civilisation. Whoever wants in Byzantium, they should go in Byzantium", Mr Milanovic said then on the occasion of the introduction of sexual education in Croatian schools. I remembered this epithet after I read the final "statement" of the very ambitiously organised by the Greek Council Presidency conference on enlargement with the participation of representatives of the countries that want EU membership in the Western Balkan region. The conference took place in Thessaloniki in the framework of the informal meeting of the EU foreign ministers, but in spite of the big ambition, in it took part only 6 ministers or their deputies out of total 24 countries. I cannot give another definition of an event which was broadly advertised as a desire to push the enlargement process out of the deadlock, especially some problematic, but instead it ended up as a plot of three countries the deadlock to continue. We have Bosnia and Herzegovina, which has seriously scared the region with the mass demonstrations of tens of thousands of unemployed Bosnians and reminded of the highly fragile foundations of the state of Bosnia and Herzegovina. This led to various initiatives to restart the European integration process in the country to avoid the country turn into a clockwork mechanism the explosion of which is approaching with the rise of the already too high number of unemployed and perspectiveless people. Hope for maturity and learnt lessons from the not so distant past of Europe and the region gave Croatia's initiative which offered a not so radical a change of the accession conditions but which has the potential to seriously stir the process or at least to trigger a debate on BiH's future. We also have Macedonia which, with every year of waiting to start accession negotiations, is turning into a failed state where media are growingly not free, the power is entrenching itself more and more and instead of going for reforms they are postponed for the ever more unclear future. Macedonia is a victim of its own political class and of Greece which has been blocking the beginning of accession negotiations with Skopje because of the still unresolved dispute over the name of the former Yugoslav republic. 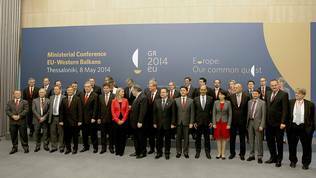 Instead of proposing options, however, Athens seems to prefer to leave Macedonia stuck further. Bulgaria, too, joined the efforts to strengthen the deadlock, a country that was until recently, at least in words, a strong supporter of the European integration of its western neighbour and close relative. A radical change of the enlargement policy is needed, said Gerald Knaus, Austrian analyst, founder of the specialised in Balkan studies think-tank European Stability Initiative (ESI). He spoke recently in Zagreb at a special discussion on the future of enlargement. 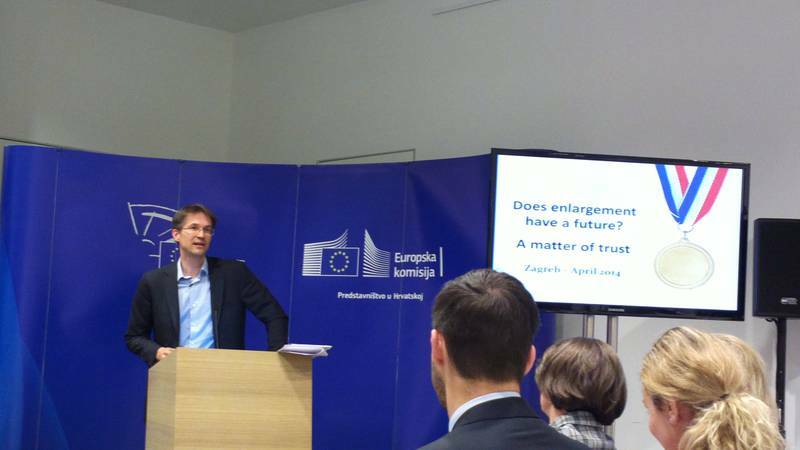 According to him, the moods of freezing enlargement in many EU member states are on the rise. A mood which can clearly be read in the messages of one of the leading candidates for the post of European Commission president with very big chances of a victory - Jean-Claude Juncker (EPP) - who said on several occasions that he does not expect new members in the next five years. Nor does he expect serious changes. However, just like the European Union has come to a crossroads and has to decide how to continue forward, the policy of enlargement, too, has reached the point where confidence is very low and a decision about its future has to be taken. The chances of the most problematic countries from the Western Balkans, like Bosnia and Herzegovina or Albania, to fulfil the accession criteria soon are miserable, Gerald Knaus added thus summarising the moods in many European capitals. In Macedonia and in other countries in the region, confidence in the EU is dropping and the Union is no longer viewed as the only alternative. The Austrian analyst is of the opinion that the EU needs a new policy, with new wording and new way of measuring progress. What a better place to discuss that than Croatia which was a "victim" of the failure with Bulgaria and Romania and was forced to work on changed criteria which proved to be a recipe for success. The opening of negotiating chapters in itself is not progress at all, the analyst explained, moreover that this requires the unanimous consent of all the member states. 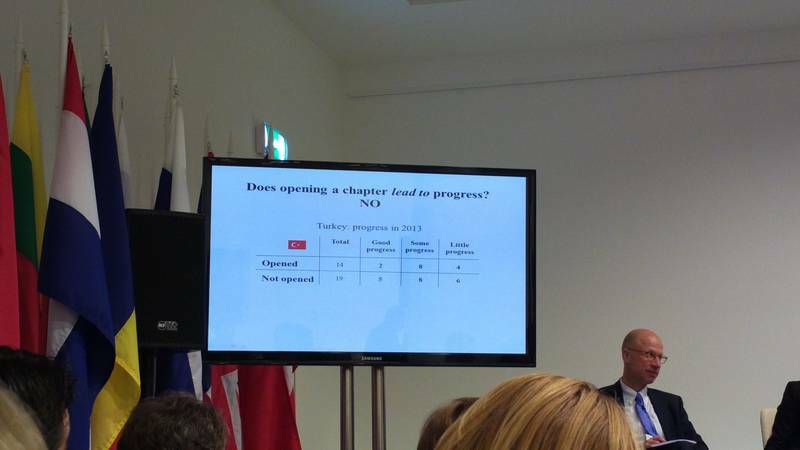 It is best to put forward conditionality for opening and closing of chapters and to specify the criteria so that they can be much easier to understand and fulfil. He believes that the "rule of law", for instance, sounds too vague and this is one of the reasons why there is almost no progress on this indicator in the region. Before the new Commission is formed and the new Parliament set up, it is very important to outline the problems the enlargement policy is facing which will help the new Commission to articulate a much more adequate enlargement strategy to bring new energy into the process. 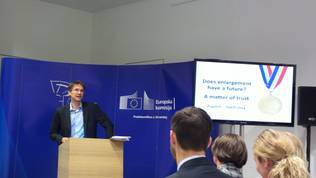 Gerald Knaus believes that the Commission is not sufficiently bold in calling the problems with their real names and criticised the famous "Brussels slang". It is because of the obvious need for change that the ambitiously called by the Greek Council Presidency conference on the issue created expectations that, finally, the debate will leave the think-tanks and will reach the decision-makers. The result, however, is more than disappointing. Furthermore, it is a consolidation, in a Byzantine way, of the status quo. The event took place on May 8th in Thessaloniki on the eve of two important anniversaries - 100 years from the beginning of World War I, which erupted precisely in the Balkans, and the 10th anniversary from the Big Bang enlargement when 10 new member states joined the Union 8 of which from the former communist camp, and one with unresolved existential problems - Cyprus. Important because, against the backdrop of the current geopolitical situation and the EU's internal problems, these two anniversaries, more than ever, demand a consideration of what has been achieved and of the mistakes made. In the programme of the event it was pointed out that the upcoming European elections and the new five-year long term of the Commission and Parliament are a wonderful foundation for "reaffirmation" of the EU's commitment to the Western Balkan countries and their European perspective. 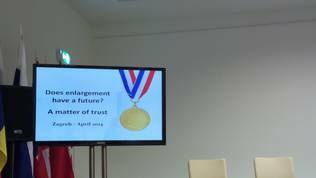 "At the same time it is important to determine ways of further promoting the European agenda of the region including by having a positive direct impact in the lives of citizens, irrespective of or in parallel with progress made in the accession process by their respective countries", was written in the invitation for the conference. What can be better than this against the backdrop of the run aground European integration process as well as against the backdrop of the initiative of the newest EU member state Croatia to restart this process and to leave the mud bank of unresolved bilateral and construction issues (specifically Bosnia and Herzegovina). Alas, the big ambition proved, in fact, a typical Byzantine manoeuvre the only aim of which was the Greek Presidency to have in its track record that it was long the countries that worked hard on enlargement while in the same time continues to hold in a deadly grip Macedonia imploding in complete lack of alternatives and isolation and thus not allowing Bosnia and Herzegovina, too, to push back from the bottom. In what was presented as a statement from the conference it is pointed out that the Western Balkans' European perspective, drawn in 2009 in Thessaloniki, is reaffirmed. Greece's Foreign Minister Evangelos Venizelos called the already 11-year old agenda "successful" and although he recognised that many things have changed in 11 years, he made it clear that there is nothing better than the agenda to continue in the same spirit in spite of the fact that back then it was envisaged the Western Balkan countries to join the EU by .... this year. In the press release, there is no new date, but, instead, the focus is shifted onto work on transport connectivity in the region. Not that this is bad. On the contrary, but it is a rather technical detail than a strategy to boost the countries from the region to work on radical reforms. "Believing that the future of Southeastern Europe lies in the EU and NATO, we reaffirm our strong support to the European and Euro-Atlantic perspectives of all the candidate, potential candidate and aspirant countries of the region, providing that all accession criteria and the existing conditionality*, set by the EU and NATO, are fully met". "Stressing that establishing and maintaining good neighbourly relations and productive regional cooperation* are essential and integral components of both the European and Euro-Atlantic enlargement processes at all their stages". With this statement, practically, it is stated firmly that the three countries are against any changes in the enlargement conditionality thus dooming to failure all initiatives like the Croatian one. 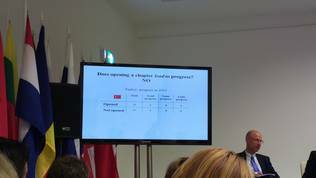 All this despite Evangelos Venizelos's claims that there is no common framework and that every candidate country is being evaluated according to its own merits. He said this responding to a question in the same vein during the press conference after the event. The three foreign ministers share the view that the countries that aspire for membership should either surface themselves from the abyss they find themselves in not only thanks to their own efforts/lack of efforts but also thanks to "pro-active" neighbours, or to drown. But the essence is that the EU should not stretch a hand. Quite a shameful position given the assistance these countries received themselves. Romania and Bulgaria got a crutch to join - the Cooperation and Verification Mechanism in the area of justice and fight against corruption - thanks to which the two countries joined the EU unprepared on January 1st, 2007. If we see the developments in Macedonia, but in Bulgaria as well, without this mechanism Bulgaria and Romania would have not yet become members of the EU. Romania demonstrated much stronger efforts and scored successes in the fight against corruption, but only after the Commission interfered dramatically in solving the political crisis in the country. Something it did not do for Bulgaria in spite of the need for this. It clearly shows that when the EU engages with the problems of a member state more seriously it can achieve significant success. Hardly there are many people who do not know what the EU has done to help Greece stay in the euro area and the EU. The theories that without the EU Greece would have managed better are prevailing, but as strong are the arguments in support of the thesis that if it were not for the EU rescue assistance Greece would have been in a much worse situation than it is now. According to the spring economic forecast of the Commission, Greece will mark positive growth this year and the unemployment begins, although barely, to decline. All this thanks to the billions of euros of assistance poured by the eurozone member states, of course in exchange for some conditionality, which was the main reason behind the birth of anti-European movements in Greece and of protests against the Troika's work. Given all this, the position of the three countries is completely not understandable, especially bearing in mind that the EU hails the Pristina-Belgrade dialogue as one if its greatest foreign policy successes, which turned into Chapter 35 of Serbia's accession negotiations with the EU. Brussels was innovative and flexible to allow Serbia begin negotiations even before it has resolved all its problems with Kosovo not recognised by Romania as an independent state and by Greece. The Croatian initiative for Bosnia and Herzegovina, as a matter of fact, is based precisely on the example of Serbia. Moreover, it has nothing to do with crutches or favours but with a real commitment by the EU to resolve a problem which is too big to be resolved by a single candidate which is yet to establish state institutions, rules and to transform its economic model. It is a shame that countries which have gone through severe dictatorship, economic crash and have paid a heavy social price to know very well the costs of doing or not doing reforms, instead of helping their neighbours to transform, just like Croatia and even better, are actually impeding reforms. They are hampering precisely the better preparation for membership, dooming these countries to a failure which could have severe consequences for the region at large. Romania's position is not understandable, given that the country has demonstrated softening of its stance on Kosovo. Last year Prime Minister Viktor Ponta hinted that in 2015 Bucharest could reconsider its view of not recognising Kosovo with the aim to "return to the European family" and a year earlier Romanian MEPs supported a resolution of the European Parliament calling on the five countries that have not yet recognised Kosovo to do it. Bulgaria's position, too, is not understandable, whose officially stated interest is Macedonia to stop the abuses with historical facts and the signing of a friendship agreement - something that definitely does not require blocking of Skopje's integration process. A large part of the problems between Sofia and Skopje can be cleared in the framework of the negotiations in a spirit precisely of good neighbourly relations and regional cooperation. Minister Venizelos has said on a number of occasions since the beginning of the Greek Presidency that Athens makes a very clear distinction between its role of a rotating presidency of the Council and its national interests. This conference, however, was practically a demonstration of a conflict of interest where it is not quite possible to separate where the presidency (which means the interests of the EU as a whole) ends and where the narrow national Greek interests begin. 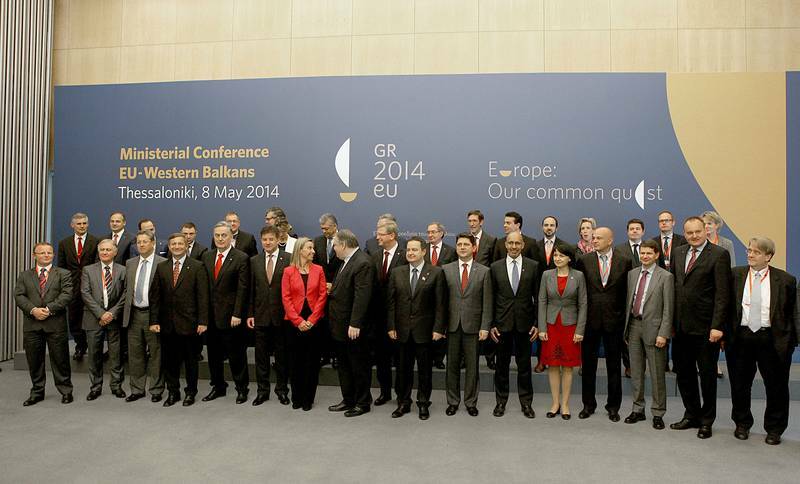 And the EU's interest as a whole is in stable and approaching the EU Balkans. This makes it even more demanding the Union to seriously begin an in-depth analysis of the problems and challenges for enlargement and to do what is necessary to prevent national interests to destroy confidence in the EU as the only reasonable alternative for weak states especially against the backdrop of the problems Russia is creating to the east. French philosopher Bernard-Henri Levy said in Zagreb on May 9th that the EU does nothing for Bosnia and Herzegovina and the Balkans at large out of a guilty conscience. Now it has a chance to do what brought it the Nobel Peace Prize in 2012 - to ensure lasting peace in the region by assisting the countries there to begin the long and painful process of transformation so that in a hundred years to be marked the beginning not of a devastating war but the beginning of a history that was unthinkable for centuries - prospering Balkans, not a gunpowder keg.